1. NO/NC mode selection, in the dip switch 1, ON for NC, OFF for NO. 4. Auto closing speed adjustment selection, in the dip 4, 0.9s and 1.3s for option. ON is for 0.3s. 5. Delay automatic closed selection. Dip switch5,6,7,8 are for it and the delaying time is 1s,2s,3s,4s,5s,8s,10s,15s,20s,25s,30s,35s,40s,50s,60s for option. 6. The boom angle adjustment, suitable for some areas that the boom can’t reach the vertical position caused by obstacle. Adjustable for 60°, 70°, 80° and 90°. And the dip switch is another independent one (1 2 switch). 7. Maintenance mode switch, convenient for possible repairing and adjusting. 8. RS485 interface, can connect with computer, check the barrier gate state and alarm information. 10. Emergent stop input signal function. 11. Arm swing out signal input function. 12. Alarm information output function. 13. Barrier gate OK signal output function. 15. Vehicle detector signal input and infrared signal input, that is, use the output COM, NC of the loop detector (normally the No.4 and No.11, specially related with detector, the barrier gate not respond to closing command when the coil is not connected).The infrared detector uses the NPN type. 1. Gate automatically open when power off, no clutch design, no need human intervention. When power on, gate automatically reset, restore to the gate closing state, truly unattended, fire safety standards. If special requirement, manual operation is required when power off, operating arm open and close manually also can be realized by setting up control board DIP switch, which ensure that the system can be used at any time. 12. Arm Open priority anti-smashing function. No matter the current gate in what state, the operator through the triple push button, software or remote control to issue an open command, the gate will give priority to the implementation of the opening action. 13. Barrier with anti-collision protection function, when the vehicle hits the gate arm, arm can be swing out to avoid damage to the vehicle, and barrier gate machine. 1. Two year’s free servicing is supplied (not including the arm and remote controller). 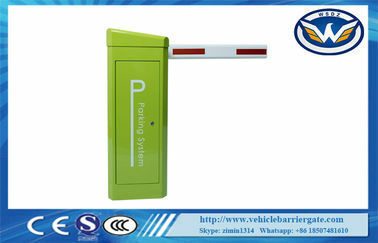 In the condition of complying with the operating instruction, without the unauthorized maintenance of the parts and the machine have no obvious mechanical damage, we will provide a quality assurance for the barrier gate product from the date of use for a period of two years or from the date of shipment up to three years including all mechanical and electronic components other than special consumables.